OCEAN'S BLUE An ocean front Islamorada oasis in the fabulous Florida Keys. At the confluence of Tavernier Creek and the Atlantic Ocean, where the ocean meets the sky, stands OCEAN'S BLUE, a 5-bedroom, 4-bath island home with pool, elevator and unparalleled views of the open water. A protected canal along the property's northwest side provides 148 feet of concrete dockage with two boat lifts, a fish cleaning station, water and shore power. The 5,530 SF residence commands 132 feet of oceanfront with seawall and tropical landscaping. Spacious outdoor patios share the magnificent ocean views and breezes. The hip breakfast bar/lounge area is perfect for entertaining. Step out onto the elevated second-level concrete pool area and relax on the expansive poolside concrete patios. More... Enjoy the convenience of an elevator which goes from ground-level to second floor main living to third floor master suite. Expansive addition built in 1998 joins with the original two-story 2-bedroom, 1 bath structure, making this ideal for a multi-generational family or all your relatives and friends. The property is private at street's end with electric gated entry and enhances by brick pavers. Dual carports are deep enough to accommodate multiple vehicles. Two ground-level rooms provide large storage areas for equipment, bait and tackle and all your water toys. The property includes a 1000 gallon fresh-water cistern and ample storage room. Situated on Plantation Key just below the island of Key Largo, OCEAN'S BLUE is located in the Village of Islamorada, the "Sportfishing capital of the world." Tavernier Creek is a main waterway between Florida Bay and the Atlantic Ocean providing easy access to the bay and ocean sides. 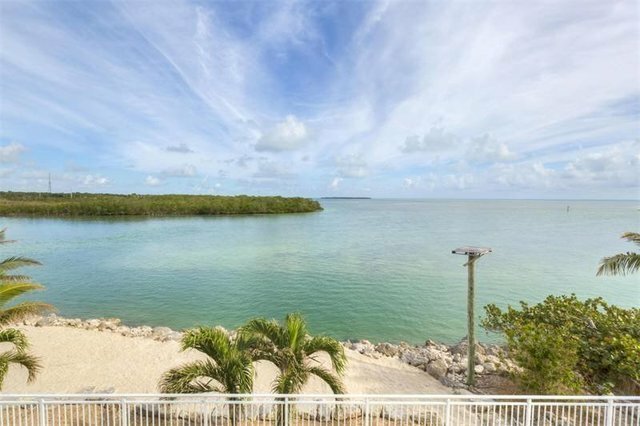 About an hour's drive south from Miami, OCEAN'S BLUE is the ideal family compound for those who enjoy fishing, boating, kayaking, diving and admiring the azure waters of the Florida Keys.